The so-called “trustees” of the social security system issued their annual report last week and the stenographers of the financial press dutifully reported that the day of reckoning when the trust funds run dry has been put off another year—-until 2034. So take a breath and kick the can. That’s five Presidential elections away! Except that is not what the report really says. On a cash basis, the OASDI (retirement and disability) funds spent $859 billion during 2014 but took in only $786 billion in taxes, thereby generating $73 billion in red ink. And by the trustees’ own reckoning, the OASDI funds will spew a cumulative cash deficit of $1.6 trillion during the 12-years covering 2015-2026. So measured by the only thing that matters—-hard cash income and outgo—-the social security system has already gone bust. What’s more, even under the White House’s rosy scenario budget forecasts, general fund outlays will exceed general revenues ex-payroll taxes by $8 trillion over the next twelve years. Needless to say, this means there will be no general fund surplus to pay the OASDI shortfall. Uncle Sam will finance the entire $1.6 trillion cash deficit by adding to the public debt. That is, Washington plans to make social security ends meet by burying unborn taxpayers even deeper in national debt in order to fund unaffordable entitlements for the current generation of retirees. The question thus recurs. How did the untrustworthies led by Treasury Secretary Jacob Lew, who signed the 2015 report, manage to turn today’s river of red ink into another 20 years of respite for our cowardly beltway politicians? They did it, in a word, by redeeming phony assets; booking phony interest income on those non-existent assets; and projecting implausible GDP growth and phantom payroll tax revenues. And that’s only the half of it! The fact is, the whole rigmarole of trust fund accounting enables these phony assumptions to compound one another, thereby obfuscating the fast approaching bankruptcy of the system. And, as will be demonstrated below, that’s what’s really happening—–even if you give credit to the $2.79 trillion of so-called “assets” which were in the OASDI funds at the end of 2014. Stated differently, the OASDI trust funds could be empty as soon as 2026, thereby triggering a devastating 33% across the board cut in benefits to affluent duffers living on Florida golf courses and destitute widows alike. Needless to say, the army of beneficiaries projected for the middle of the next decade—what will amount to the 8th largest nation on the planet—- would not take that lying down. There would be blood in the streets in Washington and eventually staggering tax increases to fund the shortfall. Such desperate measures, of course, would sink once and for all whatever faint impulse of economic growth and job creation that remained alive in the US economy at the time. In short, this year’s untrustworthies report amounts to an accounting and forecasting house of cards that is camouflaging an impending social, political and economic crisis of a magnitude not seen since the Great Depression or even the Civil War. So here follows an unpacking of the phony accounting edifice that obscures the imminent danger. The place to start is with the one data series in the report that is rock solid. Namely, the projected cost of $15.5 trillion over the next 12 years to pay for retirement and disability benefits and the related (minor) administrative costs. This staggering figure is derived from the fact that the number of beneficiaries will grow from 59 million to 79 million over the next twelve years, and that each and every one of these citizens has a payroll record that entitles them to an exact monthly benefit as a matter of law. Even the assumed COLA adjustment between 2-3% each year is pretty hard to argue with—-since it is nearly dead-on the actual CPI increase average since the year 2000. By contrast, the funny money aspect comes in on the funding side. The latter starts with the $2.79 trillion of “assets” sitting in the OASDI trust funds at the end of 2014. In truth, there is nothing there except government accounting confetti. This figure allegedly represents the accumulated excess of trust fund income over outgo historically, but every dime of that was spent long ago on aircraft carriers, cotton subsidies, green energy boondoggles, prison facilities for pot smokers, education grants, NSA’s cellphone monitors, space launches and the rest of Washington’s general government spending machine. So when the untrustworthies claim that that social security is “solvent” until 2034 the only thing they are really saying is that this $2.79 trillion accounting artifact has not yet been liquidated according to the rules of trust fund arithmetic. And under those “rules” its pretty hard to actually accomplish that—-not the least due to the compounding of phantom interest on these phantom assets. To wit, the 2015 report says that the OASDI funds will earn $1.2 trillion of interest income during the next twelve years. To be sure, the nation’s retirees and savers might well ask how Washington’s bookkeepers could manage to get the assumed 3.5% interest rate on the government’s assets compared to the 0.3% ordinary citizens earn on a bank account or even 2.2% on a 10-year treasury bond. But that’s not the real scam. The skunk in the woodpile is actually an utterly arbitrary and unjustifiable assumption about the rate of nominal GDP growth and therefore the associated gain in projected payroll tax revenues coming into the trust fund. What the untrustworthies have done here is indulge in the perfidious game of goal-seeked forecasting. That is, they have backed into a GDP growth rate sufficient to keep payroll tax revenues close to the level of benefit payouts, thereby minimizing the annual cash deficit. This, in turn, ensures that the trust fund asset balance stays close to its current $2.7 trillion level in the years just ahead, and, mirabile dictu, permits it to earn upwards of $100 billion of “interest” each year. Too be sure, beneficiaries could not actually pay for their groceries and rent with this sort of trust fund “income”, but it does keep the asset balance high and the solvency can bouncing down the road a few more years. But here’s the thing. Plug in a realistic figure for GDP growth and payroll tax revenue increases and the whole trust fund accounting scheme collapses; the bouncing can runs smack dab into a wall of trust fund insolvency. To wit, the untrustworthies who wrote the report assumed that nominal GDP would grow at a 5.1% annual rate for the next 12 years. Yet the actual growth rate has never come close to that during the entire 21st century to date. At best these people are dreaming, but the truth is they are either lying or stupid. Given the self-evident headwinds everywhere in the world, and year after year of failed “escape velocity” at home, no one paying a modicum of attention would expect US GDP to suddenly get up on its hind legs and race forward as far as the eye can see. Yet that’s exactly what the social security untrustworthies have done by assuming nominal GDP growth 35% higher than the actual 3.8% compound growth rate since the year 2000. But its actually worse. Since reaching peak debt just prior to the financial crisis, the US rate of GDP growth has decelerated even more. And going forward, there is no meaningful prospect of recovery in the face of the growing deflationary tide in the global economy and the unavoidable necessity for the Fed and other central banks to normalize interest rates in the decade ahead. Failing that they will literally blow-up the world’s monetary system in a devastating currency race to the bottom. Thus, during Q1 2008, which marked the end of the domestic credit binge, nominal GDP posted at $14.67 trillion, and during the most recent quarter it came in at $17.69 trillion. That amounts to an seven-year gain of just $3 trillion and an annual growth rate of 2.7%. Now surely there will be another recession before 2026. If not, we will end up with 200 straight quarters of business cycle expansion—-a preposterous prospect never remotely experienced previously. Indeed, in our modern central bank driven world, where both recessions this century have resulted from the bursting of financial bubbles, the proposition is even starker. Namely, no bursting bubbles or market crashes for 18 years! No, the historical business cycle expansions depicted below make clear that there will be another business cycle downturn. 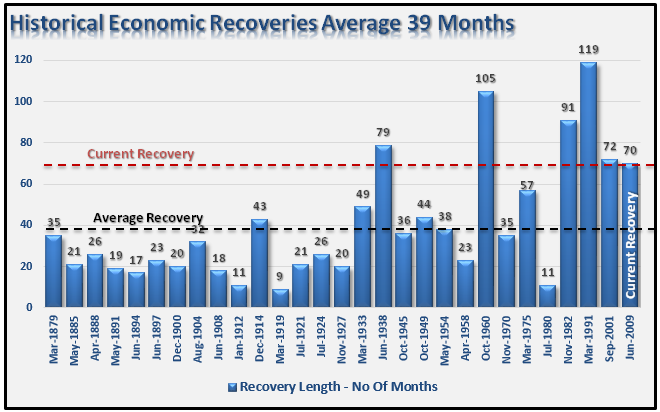 After all, contrary to the untrustworthies assumption that the current business cycle will last forever, and, in the analysis at hand for 200 months through the end of 2026, the average expansion has lasted just 39 months and the longest ever was only 119 months. During the last business cycle contraction, in fact, nominal GDP declined by 3.4% between Q3 2008 and Q2 2009. And when you average that in with the 3.3% nominal GDP growth rate which we have had during the so-called recovery of the last four years, you not only get the aforementioned 2.7% trend rate of nominal GDP growth, but you are also hard-pressed to say how it can be bested in the years ahead. Indeed, there is a now an unprecedented deflationary tide rolling through the world economy owing to the last 15 years of rampant money printing and financial repression by the central banks. By collectively monetizing upwards of $20 trillion of public debt and other existing securities and driving interest rates toward the zero bound in nominal terms and deep into negative territory in real terms, they have generated two massive, deflationary distortions that have now sunk deep roots in the world economy. First, credit market debt outstanding has soared from $85 trillion to $200 trillion. This means future economic growth practically everywhere on the planet will be freighted-down by unprecedented, debilitating debt service costs. At the same time, massive overinvestment in mining, energy, shipping and manufacturing spurred by central bank enabled cheap capital has generated a huge overhang of excess capacity. This is already fueling a downward spiral of commodity and industrial prices and profit margins, and there is no end in sight. Iron ore prices which peaked at $200 per ton a few years back, for example, are now under $50 and heading for $30. Likewise, met coal prices which peaked at $400 per ton are heading under $100, while crude oil is heading for a retest of the $35 level hit during the financial crisis, and copper is on track to plunge from its recent peak of $4/pound toward $1. These deflationary currents will suppress nominal income growth for a decade or longer owing to a now commencing counter-trend of low capital investment, shrinking industrial profits, tepid wage growth and falling prices for tradable goods and services. Accordingly, even maintaining the average nominal GDP growth rate of 2.7% realized over the last seven years will be a tall order for the US economy. Needless to say, the law of compound arithmetic can be a brutal thing if you start with a delusional hockey stick and seek to bend it back to earth. In this case, the trustee report’s 5.1% GDP growth rate assumption results in $31 trillion of GDP by 2026. Stated differently, compared to only $3 trillion of nominal GDP growth in the last 7 years we are purportedly going to get $14 trillion in the next 12 years. But let’s see. If we stay on the current 2.7% growth track, then GDP will come in at $24 trillion in 2026. Since OASDI payroll taxes amount to about 4.5% of GDP, it doesn’t take a lot of figuring to see that trust fund income would be dramatically lower in a $7 trillion smaller economy. To be exact, the untrustworthies have goal-seeked their report to generate $1.425 trillion of payroll tax revenue 12-years from now. Yet based on a simple continuation of the deeply embedded GDP growth trend of the last seven years, payroll revenue would come in at only $1.1 trillion in 2026 or $325 billion lower in that year alone. And here’s where the self-feeding illusion of trust fund accounting rears its ugly head. What counts is not simply the end-year delta, but the entire area of difference under the curve. That’s because every cumulative dollar of payroll tax shortfall not only reduces the reserve asset balance, but also the phantom interest income earned on it. So what happens under a scenario of lower payroll tax revenues is that the $2.7 trillion of current trust fund “assets” begins circling the accounting drain with increasing velocity as time passes. In effect, the permission granted to Washington to kick the can by this year’s untrustworthies report gets revoked, and right fast. To wit, instead of a cumulative total of $13.2 trillion of payroll tax revenue over the next 12 years, the actual, demonstrated GDP growth path of the present era would generate only $11.2 trillion during that period. That $2 trillion revenue difference not only ionizes most of the so-called trust fund assets, but also reduces the ending balance so rapidly that by the final year interest income computes to only $25 billion, not $100 billion as under the current report. In short, by 2026 trust fund revenue would be $400 billion per year lower owing to lower taxes and less phantom interest. Accordingly, the current modest projected trust fund deficit of $150 billion would explode to upwards of $600 billion after the last of the phony interest income was booked. Needless to say, that massive shortfall would amount to nearly 33% of the projected OASDI outgo of $1.8 trillion for 2026. More importantly, instead of a healthy cushion of $2.4 trillion of assets (or two year’s outgo) as the untrustworthies projected last week, the fund balance would be down to just $80 billion at year-end 2026. Now that’s about 15 days of the next year’s OASDI outlays. The system would go tilt. Benefits would be automatically cut back to the level of tax revenue or by 33%. The greatest social crisis of the century would be storming out of every hill and dale in the land. Yes, Jacob Lew is a Washington-Wall Street apparatchik who wouldn’t grasp the self-destructing flaws of trust fund accounting if they smacked him in the forehead. And the same is apparently true for the other trustees. But here’s where the venality comes in. In order to goal-seek to 5% nominal GDP growth, the trustees report assumes that real GDP will average 3.1% per year through the year 2020. Now, c’mon folks. Since the pre-crisis peak in late 2007, real GDP growth has averaged only 1.2% annually, and only 1.8% per year during the entire 15-years of this century. Anybody who signed up for 3.1% real growth through 2020——that is, for scorching growth during month 67 through month 140 of a tepid business cycle expansion which is already long-in-the-tooth by historical standards—-is flat-out irresponsible and dishonest. Calling their mendacious handiwork the “untrustworthies report” is actually more flattering than they deserve.